Ruby red with violet reflections. The bouquet is intense and denotes a pleasant complexity, with notes of cassis, cherries jam, plums and chocolate. It then fades into very clean flavors of tobacco, vanilla, eucalyptus and spice. These pleasant spicy notes added by Syrah exalts the sensations of red and black fruit and aromatic herbs, given by Sangiovese as well as the roundness typical of Merlot. Harmonic and well balanced, the initial predominance of fruity notes develops to compliment the round and elegant tannins. The aftertaste is long and satisfying with refined notes of ripe fruits together with aromas of pepper, vanilla and balsamic herbs. 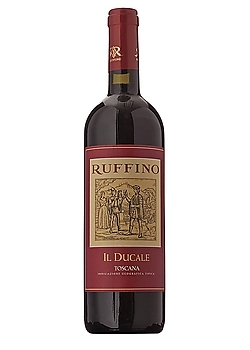 A modern Tuscan wine born from Ruffino's century old winemaking tradition.